Your Opportunity to Visit the Amazon! At the Victoria Crown Affair on May 6, Pandemonium Aviaries will auction a once-in-a-lifetime adventure in the Peruvian Amazon! Winners of this live auction item will get 5 days and 6 nights courtesy of Rainforest Expeditions which donated these trips. You may be going to a remote area, but you'll travel in "rustic luxury," with an amazing staff anticipating your comforts and questions. Our family has traveled extensively, but taking our kids on this tour to the rainforest last year was our best adventure ever. It started with a boat ride from Puerto Maldonado, Peru. As we rode upriver, we enjoyed a Peruvian lunch wrapped in banana leaves while the guides pointed out the unique plants and animals. The photo opportunities were just incredible. We think some of our pictures look professional! 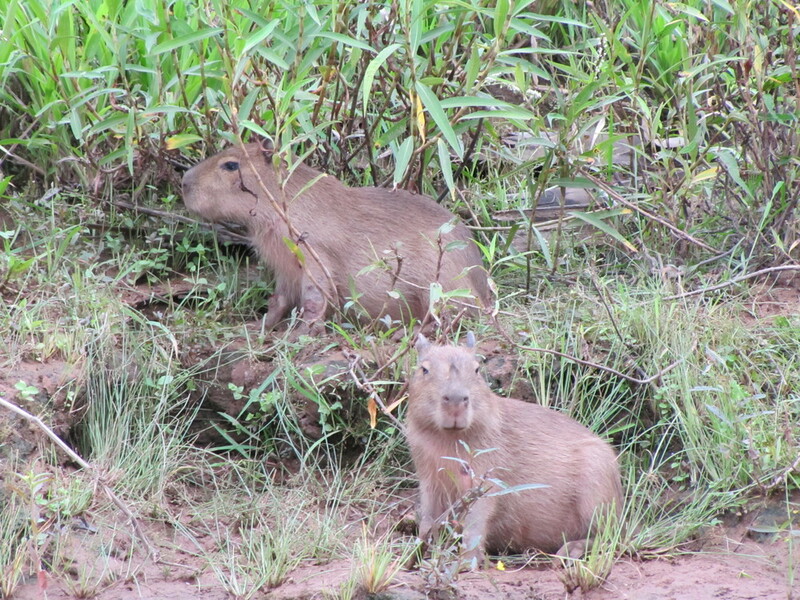 We swear the caimans and capybaras even posed for us. After our boat docked, we hiked for a few minutes through the dense rainforest. Then the path opened up to a view of a beautiful 2-story lodge and the sound of a blender at the bar where they fixed us our favorite drinks. Hot chocolate for the kids! "Cheers" in the jungle? Now that's what I call a vacation! The meals were authentic Peruvian food. After dinner, some of us listened to a lecture about the rainforest while others retired to hammocks to read, and some families gathered to play board games. The competition could get pretty lively. It IS the jungle, after all. Bedrooms were open-air verandas where we could enjoy the sounds of the jungle as we slept. We happened to run into a rare stretch of cold weather with night time temperatures in the low 50s F! To keep us comfortable, the staff even put hot water bottles in our beds. We were serenaded by weaverbirds the next morning. Video here. Refugio has a 25 meter scaffolding that you can climb to get a better view of the birds at treetop, and an appreciation of how dense the foliage really is. The next boatride took us further upriver to the even MORE remote Tambopata Research Center. The accommodations again were rustic luxury. 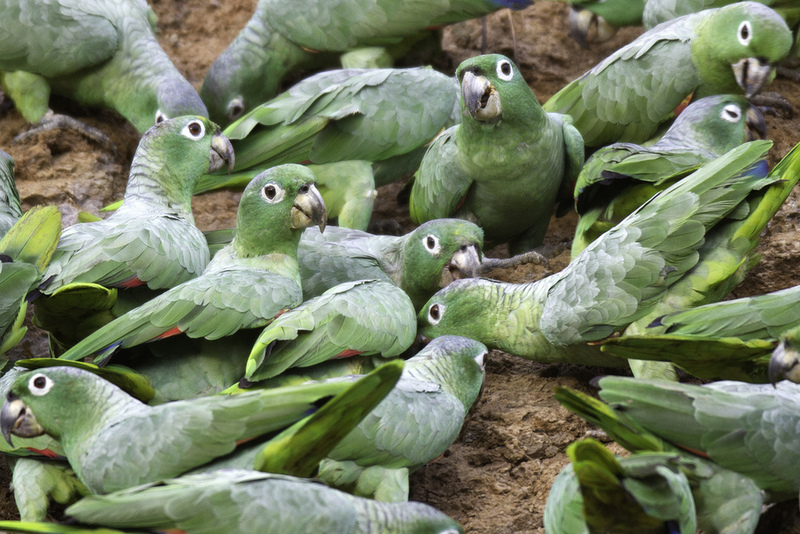 As the name implies, serious research takes place here, as scientists and grad students study several generations of macaws. The research teams joined us at breakfast and answered questions about their research. Although the birds are wild, they were not above sneaking a bit of my breakfast when my back was turned. For most people, the highlight of TRC is the visit to the clay licks where we saw dozens of Green-winged, Scarlet and Blue-and-gold Macaws and hundreds of smaller parrots. After dinner that night, the scientists gave a talk on the biology of macaws, their feeding habits, and theories on why they congregate at the clay licks. TRC offered a range of great activities to choose from. We especially enjoyed the hike to pond where we paddled around and saw some of Peru's strangest birds, such as the hoatzin, nicknamed stinkbirds! Evening hikes gave us the chance to see and hear a different side of the rainforest. The professional guides could tell us what strange animals were making the exotic sounds we heard, and led us to nocturnal animals we'd never have spotted ourselves. The guides were especially wonderful with our kids, who were captivated by every new sight and experience. This is just the very briefest overview of what we did. Each minute held new discoveries. If you want more details on our experiences in the rainforest or anywhere else in Peru, I welcome your email. If you win the live auction, Rainforest Expeditions will allow you to exchange this adventure for another and will credit the value of the package you won. For instance, if you like our photos, just imagine what pictures you could take using special lenses with the guidance of a professional photographer. Jeff Cremer offers Wildlife Photography Tours at these locations. Check out his work.